General Election week is here! This Thursday, make sure you get out and vote. Even if you spoil your ballot, it’s important that you have your say. You have a whole 15 hours to find your polling station and mark a cross for your next MP (and also your new local councillor). Remember to do it – this is expected to be the closest election in recent history, so every vote could make a difference. Retaining their lead, the Green Party increased their share of the vote to 40% last week. Having led every Redbrick poll since its launch in February, the party will be celebrating this implied popularity among students. Whether this will translate into votes and, indeed, a seat this Thursday is yet to be seen, with Labour likely to hold both the Selly Oak and Edgbaston seats comfortably. The Conservative Party also increased their share of the vote by 4% this week, whilst Labour suffered another loss in their somewhat inconsistent poll support, dropping from 24% to 21%, returning them to third place. The Liberal Democrats suffered a larger loss than last week, falling from 10% to 2%, whilst UKIP voters returned to 0. Students registering their interest in voting for a different party also remained the same as last week, at 2%. Meanwhile, students saying they would not vote or did not know who to vote for also received 2%. 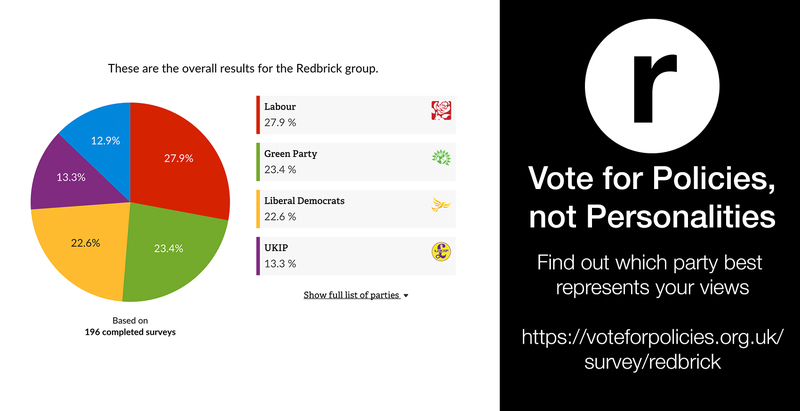 A total of 57 students participated in this week’s Redbrick poll. This week, we’ll only be running the poll between Monday and Wednesday, and we encourage you to go out and vote on Thursday. We’ll be reporting on all the results as they come in on our General Election hub. The latest issue of Redbrick includes a double-page feature covering the General Election; make sure to check it out. We’ve also released the results – as of last Thursday – of our Vote for Policies survey, detailing which issues and which parties came top among students. (Note: This poll is neither representative nor accurate. Rather, it is more of an initiative to get the general feeling of students on campus, and to try to engage more students in politics in the run-up to the General Election. Therefore, take the results with a pinch of salt).